The number of people affected by river flooding worldwide could nearly triple in the next 15 years, analysis shows. Climate change and population growth are driving the increase, according to the World Resources Institute (WRI). In the UK, about 76,000 people a year could be at risk of being affected by flooding if defences aren't improved, it says. The yearly cost of damage to urban areas could reach more than £1bn. The centre says this is the first public analysis of all world data on current and future river-flood risks. 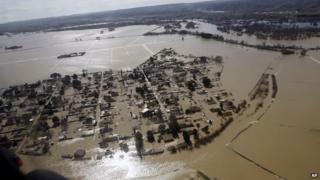 It demonstrates some 20 million people are at risk of being affected by flooding, and it costs almost £65bn in GDP. According to the new evaluation, in just 15 years time these numbers could rise to around 50 million people with an annual potential cost to the world economy of around £340bn. Much of this is attributed to climate change and socioeconomic development. By 2030, if there isn't any increased investment in flood prevention, the UK could be facing a yearly bill of more than £2bn. The World Bank says that this calculator will help to inform governments about mitigation and defence strategies. According to the Red Cross, almost half of natural disasters they dealt with last year were caused by floods.